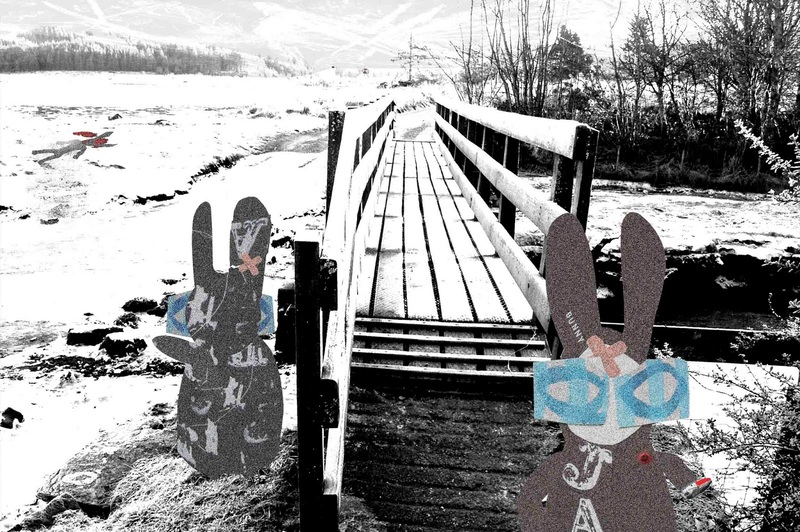 The Wabbit and Wabsworth were the worse for wear, but they trudged through the snow to low ground. A bridge beckoned. Wabsworth didn't like the look of it and the Wabbit even less. They scanned the territory. "Something over there," said Wabsworth, and he hopped out to make an inspection. He was quickly back. "Dead?" asked the Wabbit. "As dead as they come," said Wabsworth. The Wabbit held up a bullet. "There's another one here." Wabsworth brushed frost from his fur and adjusted his damaged ear. "It's a massacre." "This tracker is indiscriminate," sighed the Wabbit. Wabsworth looked everywhere he could. "Know who he is?" The Wabbit flipped the bullet in the air. "Whoever or whatever it is, this is the latest technology." Wabsworth growled. "By the look of our friend over there, I'd say we got off light." The Wabbit bent close to the snow and sniffed. His ears rotated a full 360 degrees. "It went that way." He held a paw level with the snow. "It's limping." Wabsworth stiffened. "I heard something." Somewhere in the monochrome landscape, there was a flash of red. "More company," said the Wabbit. Wabsworth flinched as the Wabbit's stomach grumbled loudly. "Got any food?" asked the Wabbit. Wabsworth rummaged in his coat. "Two Lurps and a frozen carrot." The Wabbit's stomach groaned. "Then we wait ..."